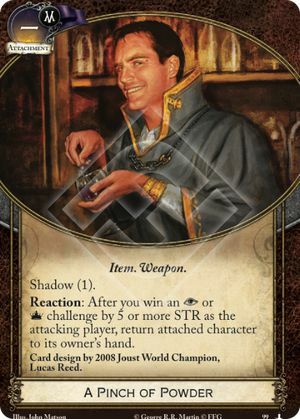 Reaction: After you win an or challenge by 5 or more STR as the attacking player, return attached character to its owner's hand. Card design by 2008 Joust World Champion, Lucas Reed. Raider from Pyke gives this card Ambush (0), because the rules say if X is not defined, it is considered to be 0. Trading With Qohor cannot find this card, because "-" is not equal to or lower than any other cost (even another "-").